CHAUVET DJ continues its wireless revolution with the EZPin IRC, a battery-powered pin spot with optional remote control. The new LED product makes it easier than ever to pin spot centerpieces or any other focal point at any venue without worrying about power draw or the availability of electric outlets. Compact yet ruggedly built, the EZpin IRC is extremely versatile and can be positioned in a variety of places. For example, the fixture’s magnetic base makes it possible to affix the pin spot to most metal surfaces without using clamps. The EZpin IRC also has unique scissor clip with an eye loop that allows the fixture to be attached to drop ceiling supports without requiring time-consuming cabling. DJs and other end-users can create different looks with the EZpin to fit the mood of different occasions by using a variety of gels, including warm white, red, green, blue and yellow. For even greater mobility, the EZpin IRC can be operated wirelessly using the optional IRC-6 remote (sold separately). As durable as it is versatile the EZpin has a single 2W LED light source with a 50,000 hours life expectancy. Despite its compact size, the EZpin makes a big impression with its intense, clearly defined light. Its battery can run for six hours before needing recharging, making it ideal for lighting weddings. 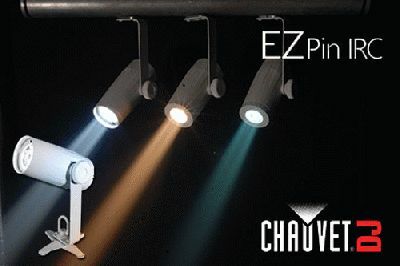 An EZpin Pack, which bundles 6 EZpin™ IRC fixtures and an IRC-6 remote with a VIP Gear Bag, is also available from CHAUVET DJ. Aside from being an attractive starter pin-spotting package, the value-driven kit also provides a cost-efficient way for mobile entertainers to build their existing lighting rigs with a go-anywhere, do-anything pin spotting solution.